Educational practice needs to become evidence informed. 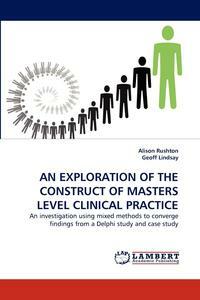 This book presents an investigation that explored a key aspect of educational practice in healthcare - the construct of Masters level clinical practice. The study was presented as partial fulfilment of a Doctorate in Education at the University of Warwick in the United Kingdom. A mixed methods approach converged findings from a quantitative Delphi study of 3 rounds, and an in- depth qualitative case study using semi-structured interviews and participant observation. There was good convergence of the data with clinical reasoning and knowledge identified as the most important components of the construct. This investigation provides important preliminary work, proposing a generic model that can be used as the basis for future research, informing course design, and the development of a tool for the assessment of student performance. This book will be valuable to medical and healthcare professionals and academics worldwide, at a time when evidence informed educational practice is essential.